"The Mob attempting to pull down Peter Woods house," Unknown Artist, 1749, British Museum. This print was brought to my attention as the cover of Nicholas Rogers' recent book Mayhem: Post-War Crime and Violence in Britain, 1748-53. 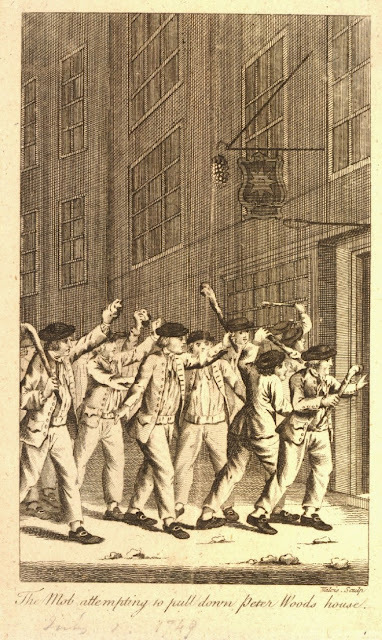 This print depicts a rioting mob of sailors making hell on Peter Wood's house and tavern during the Strand Riot of 1749. It was typical for owners of taverns, inns, coffeehouses, and alehouses to live in their place of business, just as it was for other craftsmen and tradesmen throughout the British empire. 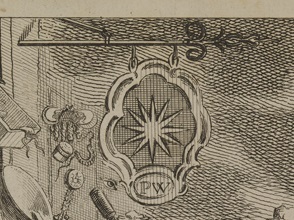 Unlike many of those fellow professionals, Peter Wood's tavern (at the sign of the star) was a well known brothel. Wood's tavern was targeted on the third night of the riots, and it was here that Bosavern Penlez was caught participating. Penlez would be hanged four months later as a looter, the only man to face justice for the upheaval. 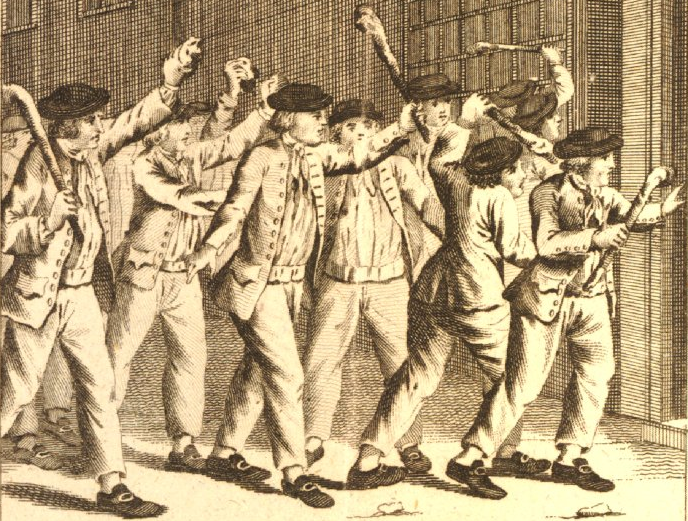 Clearly sailors were not the only ones to participate in the riots, and at least one print depicts a crowd made up of gentlemen and tradesmen, entirely devoid of mariners. 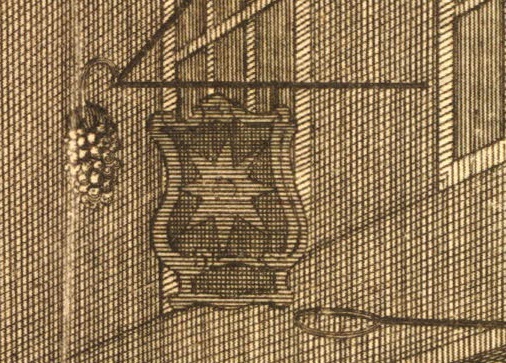 As an interesting side note, Wood's tradesign is depicted differently between this unknown artist and Charles Mosley's depiction of the same year. The Strand riot was notorious enough for each artist to know Wood's sign, but they chose to depict it in very different ways. Our uproarious tarpawlins are uniformly dressed. 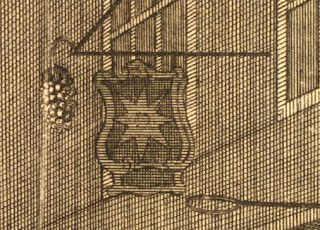 This may have been simply for the ease of the artist, or it may suggest that they are from the same crew. Regardless, they all wear round hats with short brims, single breasted jackets that end at the thigh with waist flap pockets, long legged and fairly close fitting trousers, and plain neckcloths. None of them wears a waistcoat, but they all wield cudgels. The second tar from the right is turned just far enough away from us to get a good view of the single vent at the back of his jacket. All of them wear white stockings and round toed shoes with oval buckles. Though of various hues, all of our sailors have hair that ends just above the shoulders in a roughly bob style. The only real variation between these jacks is in their cuffs. Working our way left to right, we see plain cuffs without adornment, slit cuffs, scalloped mariners' cuffs bound by two buttons, and straight marines' cuffs bound by four buttons.